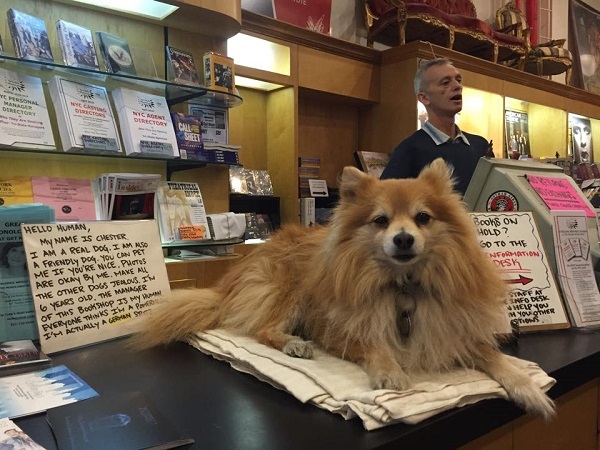 “He just had his walk so he’s all tired out.” Chester is hard at work at the Drama Book Shop in midtown Manhattan. Inspired by Humans of New York, animal welfare advocate Kim Wolf has spent two years documenting the many dogs of NYC as well as the people who care for them. Wolf created Dogs of New York to highlight the bond between humans and dogs, regardless of breed, socioeconomic background, age or gender. All the strangers that Wolf photographs are delighted to share about their canine friends, forthcoming with anecdotes and stories about their pets. Wolf runs Beyond Breed, a non-profit organization that offers access to veterinary care, supplies and educational resources. Scroll down and head over here to read more stories. Jordan and his dog Blue were enjoying the spring sunshine at the park in Bushwick, Brooklyn. Sammy and Tyson live in Bushwick, Brooklyn. "He loves doing this, checking things out."